In 1991, while planning the celebration for Fort Wayne’s first 200 years, a survey was conducted among the city’s citizens to determine the desired permanent legacies for the commemoration. Media surveys supervised by the Bicentennial Celebration Council revealed that a program for identifying and permanently marking notable historical sites in central Fort Wayne was one of the more popular legacies the city might undertake. Michael Hawfield, Allen County Fort Wayne Historical Society director at the time, prepared a 38-page Prospectus in 1992 unfolding the vision, plan and associated costs. Thus a trail idea was hatched and became one of the foremost “lasting legacies” of the Bicentennial Celebration of 1994. Original financial support for the Trail came from the Journal-Gazette Foundation and Essex Group, Inc. in conjunction with ARCH, the historic preservation organization that assumed responsibility as trustee. After twenty years, this free and open-to-the public walking trail continues to celebrate and trace Fort Wayne’s history. A committee to develop the details of a trail was formed and began its work in 1992. Serving on the panel were Craig Keoun, who chaired the group, Tom Cain, Tom Castaldi, Karen Gardner, Michael Hawfield, George Mather, Irene Walters, and Mike Westfall. Inspired by such national examples as the Boston Freedom Trail, the Committee decided not only to mark notable historical sites, but to develop a self-guided program that became known as “The Heritage Trial.” The result of its efforts was the creation of thirty-three new historical markers for the significant sites in the central city and incorporation of twenty previously marked historical sites. Also produced was a map brochure indicating the location of trail routes and markers. Criteria for choosing the sites focused on historical significance rather than on commercial or architectural interests. Decisions were made by the Trail Committee following the recommendations of a variety of local authorities. Rather than attempt to provide a comprehensive history of Fort Wayne, the Trail was intended to stir interest, to provide basic information, as well as to create excitement about the community’s past. The Trail recalls dramatic confrontations, battles and sporting events and along the path are beautiful homes, thriving industries, centers of finance and government, places dedicated to the arts, towering churches and great lines of transportation. 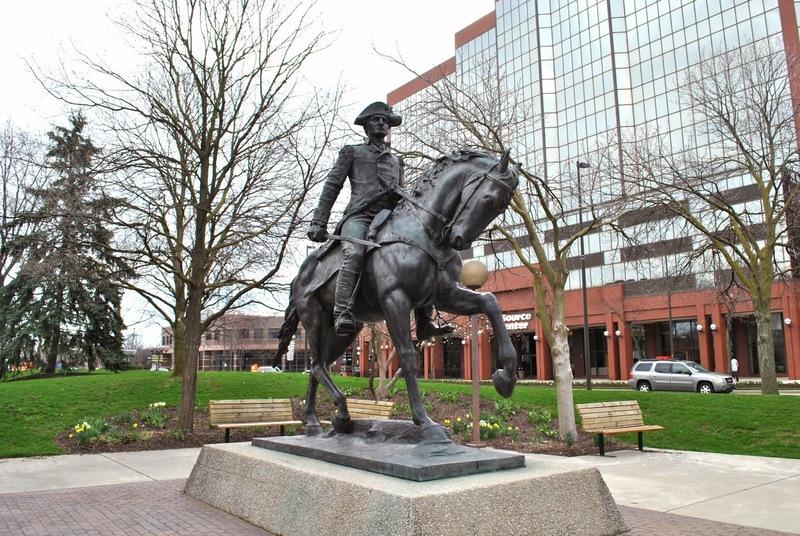 You can begin your walk in Freimann Square at the Anthony Wayne statue. It was apparent to the Committee that walking a single trail would be an exhaustive venture if it were to do justice to the story of our region’s rich heritage. To make the trail a reasonable user experience, it was separated into four shorter ones that interconnected: The Central Downtown, West Central, South Central and the Kekionga or Lakeside Neighborhood. Although the Trail is designed to join in any place along the way, the Central Downtown Trail that begins at Freimann Square Park is a convenient starting point. The markers that describe the various stops are oriented for pedestrian viewing, so walking the Trail may be a better plan than trying to sightsee from a car window. Such a motorized tour is possible especially if a docent is on hand, but there is much more to see, feel and imagine by choosing a sidewalk experience. A guidebook titled On the Heritage Trail was envisioned in the early months of the Trail Committee’s work to give additional information on each of the sign topics, providing the original sign text for old historical markers and offering information about certain other sites and topics that are important in our region’s history. Short essays about important individuals and subjects were included in the Guidebook following the route of the Trail. Its words, written by Michael Hawfield and George Mather, are in a style to help the reader conjure up an image to accompany the discussions. Proofread by Betty Stein, indexed by Amy Beatty and edited by Tom Castaldi, the book offers suggested readings to learn more about each topic. During 2005, several new sites were added and assigned to the appropriate original four trails. This expanded the Trail and a newly printed map was prepared to address each one. Among the additions are those in Headwaters Park as well as new markers added to mark the Wabash Erie Canal remnants in Rockhill Park which also makes a connection to the Wabash Erie Canal Towpath Trail. North, four markers are added to describe the St. Joseph River Feeder Canal that can be found on the west border of IPFW’s soccer campus. Also added to the map are three color coded routes marking the line of the River Greenway, the course of the Lincoln Highway and the path of the Wabash & Erie Canal. Today, nineteen of the Heritage Trail stops on the Central Downtown section have a QR code icon attached to the marker. Anyone with a digital device such as a smart phone with appropriate QRReader app downloaded can click and listen to a recorded version of the marker text provided by WBOI-fm 89.1 public radio. This article was updated by Tom in October 2014.